Meet Champ and Rick James, our October patients of the month!!! Champ is just a lil' guy at 5 months and 2 weeks old! He is a blue/fawn Frenchie who is VERY sweet and SO brave for his vaccinations!!! His temperament is GREAT, and he couldn't be any gentler with the staff at PCVH. We LOVE having him as a patient! 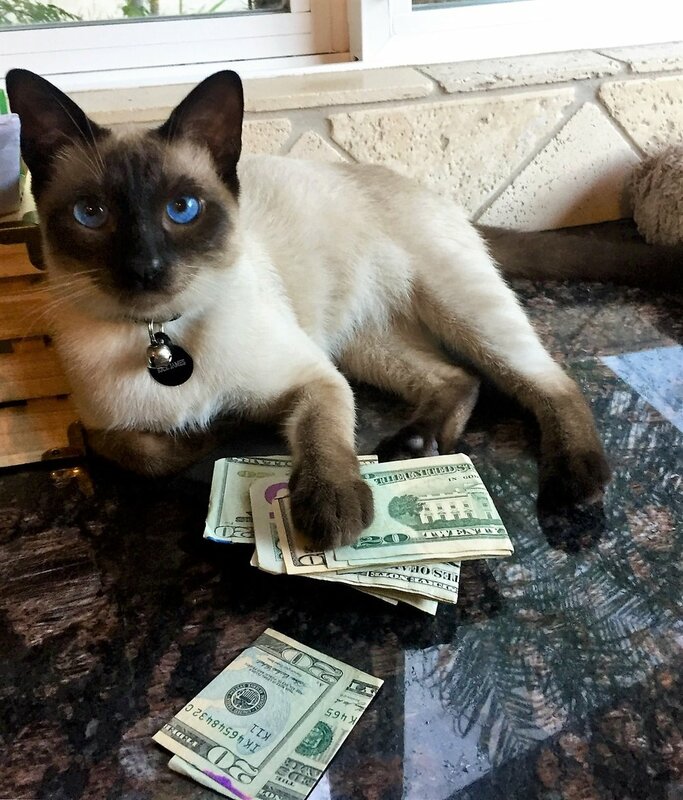 Rick James is the MOST handsome kitty (only 8 months old) with his ocean blue eyes and sassy but lovable cattitude that no one can resist! It's always SO much fun when he comes in to PCVH and let's us snuggle! June patients of the month ! Meet Meggie and Chloe.... our June patients of the month! Meggie & Chloe are ALWAYS perfect angels when they come in to PCVH. We LOVE Meggie and her headbands, and Chloe is ALWAYS adorable! They are the perfect pair and excellent patients! May Patients of the Month !!! Meet Bogie and Aurora, our May patients of the month!!! Isn't Bogie the most handsome little guy? He won't be little for long...look at those paws!!! ..AND he already knows how to work the camera! Congrats Bogie...you are ADORABLE!!! Aurora spent some time in the hospital and completely won over the staff ...we are all in love!!! We are so happy that she is doing great! Don't let that fluffy white coat fool you... she is a serious trooper!!! Congrats on being patient of the month! Meet Indy and Britt, our March "co-patients" of the month, and housemates! Indy has an impressive resume as a retired service dog, and Britt is actively working! They are AMAZING!!!! We are so impressed with what they do every day! Take a look at these sweet girls!!! Irresistable! Meet Charlie, our February patient of the month! He was seen at Pacific Coast for a liver problem (poor little guy!) which was repaired surgically. This little cutie looks soft and snuggly... but he is one tough little patient! We are so happy that he's home with his family! Meet Bruno, our January patient of the month! Bruno is the cutest little guy around and makes friends wherever he goes! He's lived at the beach and in the mountains, and LOVES Kraft singles!!! Congratulations Bruno! What a life!!! 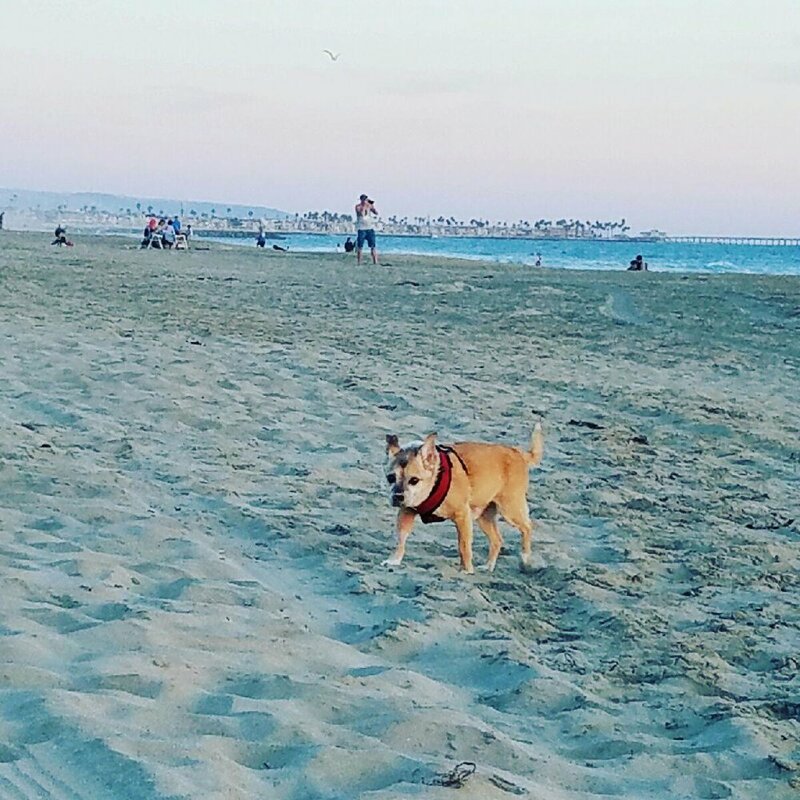 strutting his stuff at the beach! Meet "Claire", our November patient of the month! Claire was only a 4 month old tiny bundle when she was seen at PCVH for seizures. After a rough beginning, lots of tests, and amazing care by her family, she is feeling so much better and doing normal puppy things! A huge thank you to her family and the amazing volunteers at Maltese Rescue Calfornia, for being so dedicated! Congratulations Claire! You are too cute for words! Meet "Mavis", our October patient of the month! Mavis has LOTS of energy, and has been VERY busy at home, attacking those scary pillows! Good thing she's soooooo cute!!! September Patient of the Month! Meet Lucca, our SUPER RAD September patient of the month!!! We are so excited to welcome Lucca to our Pacific Coast family... she is too adorable for words! ... ...and already an overachiever, winning the pet of the month contest! August Patient(s) of the month ! Congratulations to our August patients of the month, Roy the SUPER cute schnauzer, and our COOL cat, Leroy!!! They are both loving life with their great So Cal families...looks like they are loving the camera too! Meet "Baldwin", our July patient of the month! He was brought in by Golden Retriever Rescue http://www.grcgla.org, weighing only 37 lbs and looking scraggly! He is a total lovebug, and is now eating, playing, and snuggling like a champ! What a guy! Here are a few more of our PCVH family pets!!! They are so irresistible... we can't stop posting!!! ENJOY!!! June Patients of the Month!!! This whole clan were voted in as "Patients of the Month" for June!!! Check out these cuties, all belonging to the PCVH staff! We couldn't pick just one!!! May Patient of the Month! Meet Tyler, our May patient of the month:) The staff unanimously voted that he is SUPER AWESOME!!! Congratulations for being such a cool dog, Tyler!!! April Patient(s) of the Month! Congratulations to our THREE April patient(s) of the month!!! Luther is an adorable and lovable American Standard Bulldog, just recently adopted from Pet Project Foundation!!! Looks like he is LOVING his new family:) Maddie and Marcie, our kitties, are housemates, and are soooo adorable....how could we choose just one? Luther and his adorable family!!! He is LOVING life! Marcie...look at that face! So pretty! 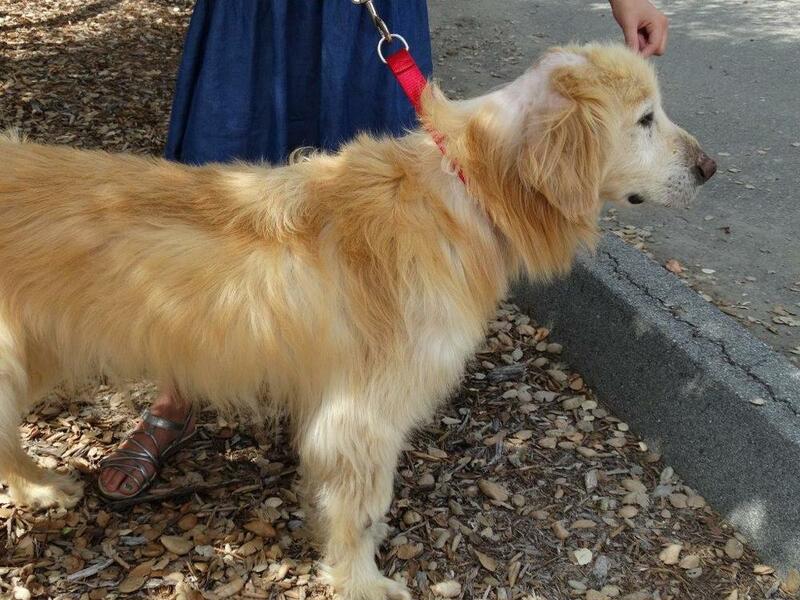 We are BEYOND excited to give everyone this update on "Merry", our amazing friend from Golden Retriever rescue. "Merry" was the PCVH Patient of the Month in January, is a tennis ball FANATIC, and is one TOUGH cookie. After being hit by a car before Christmas and brought in by a good samaritan, she had multiple pelvic fractures, spinal injuries, a skull fracture, and was paralyzed in both hind legs. 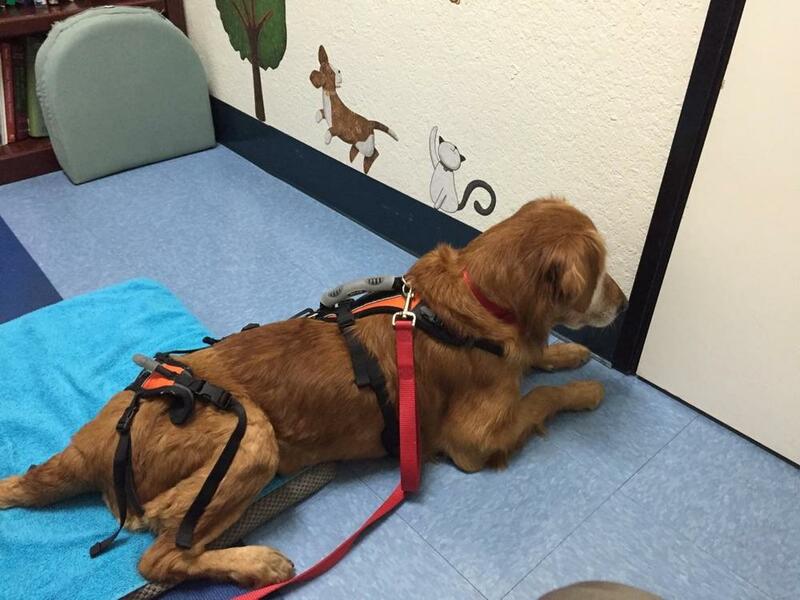 GRC-GLA Golden Retriever Rescue stepped up to pay for her extensive medical care! After several months of daily physical therapy, including workouts in an underwater treadmill, we are so happy to report that Merry is WALKING!!! Check out this video of her strutting her stuff! March 2016 Patient of the Month! Meet Shaka, our SUPER cute, fluffy, and snuggly March patient of the month! He is such a BIG boy for almost 6 months old- there's extra to love! He is already a ROCKSTAR patient, and has great manners when he comes to the office...a true gentleman! Congrats, Shaka! Update on Merry, our little Golden Rescue patient who has been a patient/resident at PCVH since before Christmas, with a fractured skull, multiple pelvic fractures and a spinal cord injury. She is AMAZING in strength and spirit, and is getting stronger every day! This weekend, she left for her new foster home (weep, weep) and will be ramping up her physical therapy sessions on an underwater treadmill. A HUGE thanks to Golden Retriever Rescue (www.grcgla.org) for bringing her to us and saving her life, and to her new foster mom! We will miss her SOOOO much! Here are some pics of Merry on her new adventure! February 2016 patient(s) of the month ! Bruce...what a handsome boy ! Our January Pet of the month is "Merry", the sweetest Golden around!!! She came to us in rough shape with LOTS of serious injuries and paralyzed in her back legs. After surgery to repair her fractures (thank you GRC-GLA, our Golden Rescue), and LOTS of rehab (yes, she has a workout program), she is slowly improving. She was able to stand on her own for the first time on Jan 5! She's a trooper, and LOVES her tennis ball !